Bright, wild and smart - would you like become a fox? Ordinary Hoodie? - no, that's a lifestyle! Elegant, funny and a bit philosophic. Life is too short to wait until rain stops. Start dancing! Do you Agree? Hoodie "Fox" is for you! Hoodies is the new fashion trend - you can wear in city, forest,at training, at work. it can be used for any occasion. My hoodie came today, and it is absolutely stellar. The colors are perfect and the construction is incredibly sturdy. The fabric is soft but strong sweatshirt jersey, which is a shockingly hard thing to track down in a hoodie with ears. Most seem to be made from cheap, greasy/gross fleece. It was absolutely worth the wait for the custom order colors. The hood is deep enough that it provides full coverage of my head even when my hair is in a bun (with hair sticks) which is another awesome thing about the build. Most commercial hooded sweatshirts do not provide an adequate hood, so when walking through mist or rain your head still gets wet. The best thing I can advise for potential buyers is to be patient. The wait is utterly, absolutely worth it for the quality and care put into building the hoodie. It is an amazing hoodie indeed. Fits perfectly on me and it is really warm. The small gloves help keep the cold away. I love this hoodie so much!!!! It's awesome quality; put together beautiful and the material used is good! Its warm too, can't wait to use it when it cools down a little more! I went one size up, because I wanted to to be a little loose so I can layer. I would rebuy this again!! It also arrived way faster than I thought it would, nice surprise!!! Thank you!! Great Quality!!!! Excellent communication! Fast Shipping. Great Seller. It is very soft. It has two holes on the hand cuffs to make it like a Fox's paw which is more beast like. 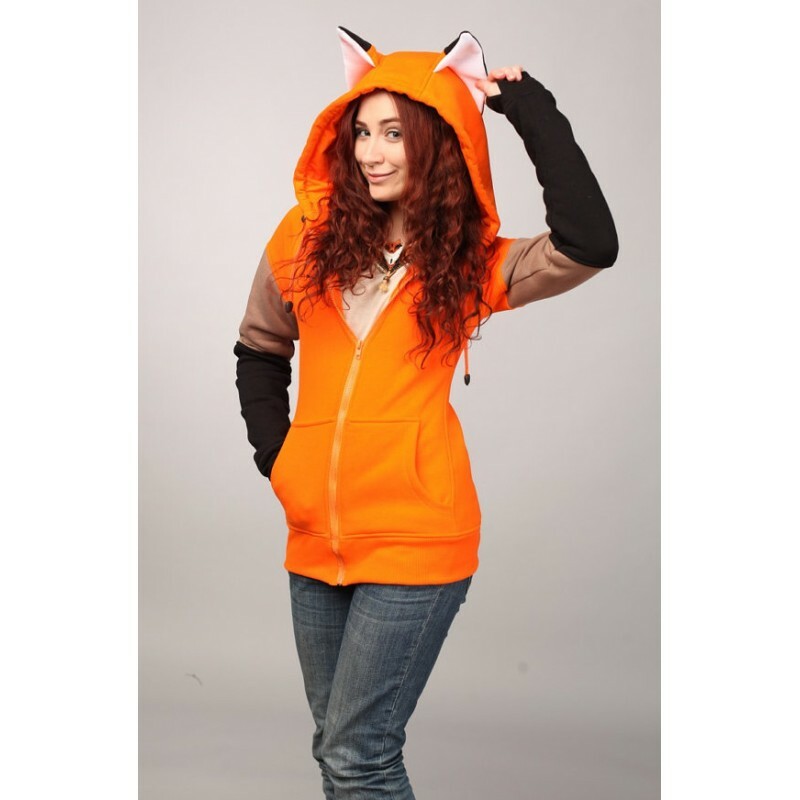 To top it off the color of the arms matches a Fox's legs and comes with ears on the hoodie.Great buy. I recommend this to any one looking for a good hoodie. Comfortable, cute and fits well. Love it! Very soft, comfy and well made. Definitely warm. It was a pleasure ordering and any questions were happily answered in a timely way. Only good things to say, cheers!